This product market is closed. The above quoted is for per piece price, with minimum purchase of 25 pcs or more PAMP Suisse Lady Fortuna 10 gram Gold Bars (With Veriscan®). * Gold is traded Monday to Friday, 9:45am - 4:00pm only. * Self collection only. Pick up at our office. No shipping service available for this item. 10 gram .9999+ Fine PAMP Gold Bars contain 10 gram of Gold. 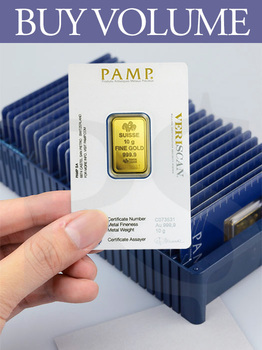 Each is individually serial numbered with original assay card and their value gains even more security with new Veriscan® technology that helps ensure the bar's origin when buying on the secondary market. These conveniently-sized gold bars are guaranteed by the internationally recognized PAMP (Produits Artistiques de Métaux Précieux) Suisse refinery of Switzerland to have accurate weights and a fineness of .9999. Each bar is hallmarked with its purity, weight, and serial number as well as with the world famous PAMP Suisse logo, Fortuna, the Roman goddess of fortune, here represented blind accompanied by her traditional attributes: the cornucopia of plenty and the rudder of fate. 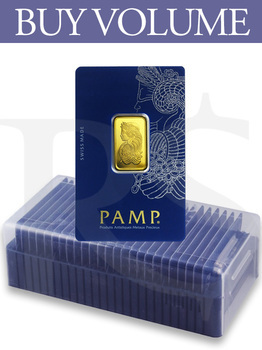 PAMP Suisse bars offer the discerning investor an opportunity to own gold that is affordable, beautiful, and secure. This Box of 25 x 10 gram Gold Bars of .9999 fine gold make for a great way to store fractional bullion, and it can be used as birthday, graduation or corporate anniversary gifts. All PAMP Suisse Gold Bars ship with their respective assay cards and each PAMP Suisse Lady Fortuna 10 gram Gold Bar measures 26.5mm x 15.8mm with thickness of 1.25mm. Dimensions of the Assay Cards Storage Box is L:185mm x H:60mm x W:95mm and weight: 185 gram. Note: Original Assay Cards Storage Box is bundled for in a lot of 25pcs only, extra pcs will NOT provide any boxes. Also available PAMP Suisse Bullion Storage Box (Holds 25 Assay Cards). Click here to learn more about Lady Fortuna.